It’s fashionable to deride the Thonglor/Ekamai area as Ground Zero for Black Label whisky-swilling, hair gel-encrusted Thai hipster types, but there really is good, authentic and cheap Thai food to be found on just about every street corner in the neighborhood. 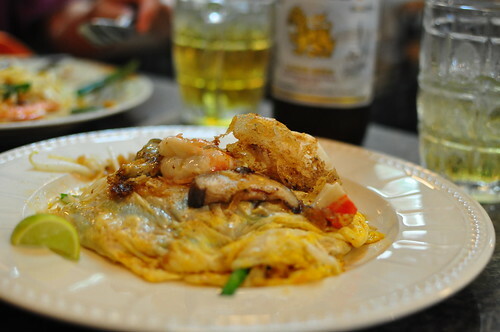 Case in point: Hoy Tod Chaolay, which not only serves up the aforementioned hoy tod (oyster omelettes, barely cooked briny goodness enveloped in a crispy, eggy shell and slathered in grease and chili sauce), but some surprisingly decent pad Thai. I wouldn’t go so far as to say it’s the best in Bangkok, but it’s up there, close to Thipsamai in the Old City area–considered the go-to place for all things pad thai (more on that later). It’s also a Thai dish with Chinese roots. Noodle dishes are associated with the Chinese, who relocated to Thailand en masse in the 1800s. The thing that differentiates pad thai from the other noodle dishes like guay thiew (noodles in soup) is that pad thai is a Chinese dish made with Thai flavors, according to Thai celebrity chef McDang. I’ve even heard people say that pad thai has inherently political roots: a conscientious effort to “take” noodles from the Chinese community by dressing them up in Thai spices like chilies and tamarind juice. No matter what its origins, pad thai is delicious when made right, but miserable when it’s overly salted, too greasy, or over-sweetened. 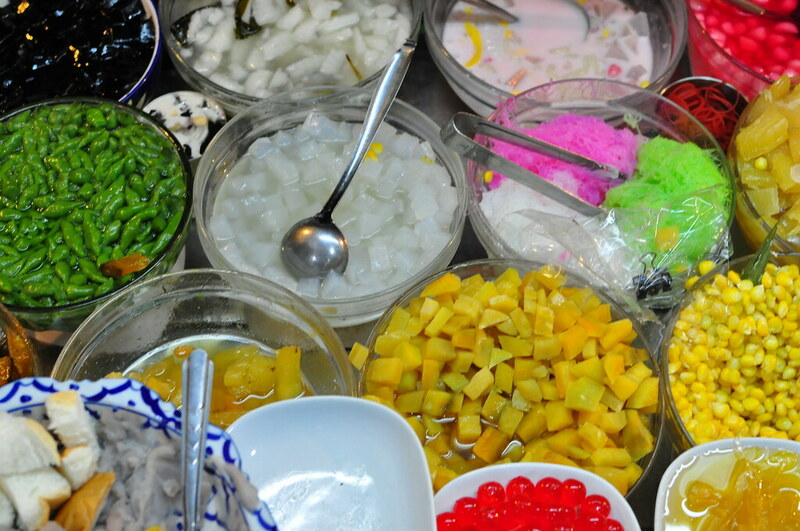 One Thai dessert I’ve only just recently rediscovered is thao tung, which is a salad bar-like collection of yummy tidbits that you would put in a ginger, syrup, or coconut broth and crown with a whopping giant handful of shaved ice. It is heaven during the hot season and the best way I can think of to end the day. It could look intimidating coming up to one of these counters and ordering a bowlful of this or that, but you can really have a lot of fun coming up with your own favorite combinations, and it’s an opportunity to get creative: no one’s judging you. A general rule of thumb is to limit yourself to three choices (but I have a hard time sticking to that rule myself). Thanks to @specialkrb for the truly fantastic photos here, and the super-informative pad thai video! She has been providing us with crazy great photos for the entire week, which may be partly to blame for why she is feeling so under the weather today. Luckily i have now found a great little cafe type place, where krapow gai is a third of the price of the hotel restaurants, and they don’t mind frying eggs. Do you do consultancy work with this Bangkok Glutton thing? I’d like you to hunt something down for me… my mum used to make guaydieow neau sap — flat rice noodles, with minced beef fried with galangal and chilli, served with fresh lettuce and tomato. Anyway, i’ve never found anywhere in Bangkok that actually has it — although i’ve managed to talk a couple of street stalls into trying to do it, but it’s never been right. Could you see if anywhere has it while you’re on your travels? Because minced beef noodle are considered an old-fashioned dish, you’ll be hard-pressed to find it on the street these days. But Thai cafes that cater mainly to a lunchtime crowd — like Kalaprapruek — have it, although their version doesn’t include the cumin that gives the dish its yellow color and great flavor (btw, I’ve never seen it with tomato, which must be an innovation). 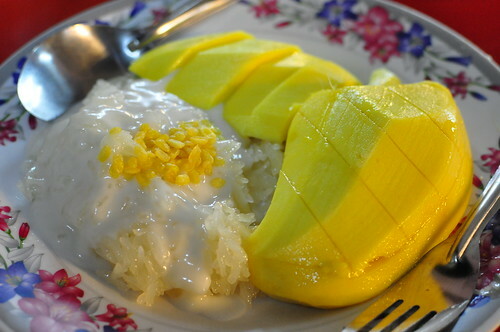 I’ve heard Taling Pling off of Silom Rd also has it. If the Red Shirts aren’t camping out there on your next trip to BKK, you should go. very envious. here, the Thai restaurant at the Al Ain Palace Hotel refused to give me a fried egg with my Krapow Gai, saying that it wasn’t on the menu. Omellette was on the menu though, so i asked if i could have that but with the eggs unbeaten, which was also impossible. Refusing to help is so unThai — this place must do something to your soul. They were probably too lazy to try to figure out the new profit margin with the added fried egg. That said, what are you doing eating Thai food at that place? There must be other Thai restaurants in Abu Dhabi.